Zapovednik Nizhne-Svirsky, in Leningrad Region, was established in 1980. Its area is 41.6 thousand ha. 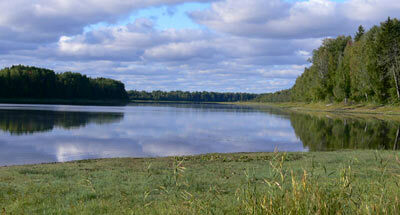 The Zapovednik is situated on the south-eastern shore of Lake Ladozhskoye, in the low reaches of the Svir River. The relief is plain, with sand beach ridges and swamped lowlands. The largest lake is 1.8 thousand ha. 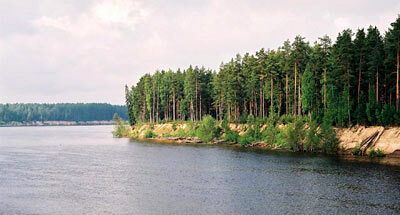 The woodland area is 19.5 thousand ha; that of mires,14 thousand ha, the water area of the Svir Bay, over 5 thousand ha. Pine forests prevail, mostly young lichen-green moss pine forests, occasionally older-age pine forests have remained. On the edge of mires and shallow depressions paludal pine forests grow; at the sites of old felling, aspen forests, birch forests, white alder forests. Mires are diverse, oligotrophic moors predominating. The shoreline is occupied by reed and willow thickets. There are 476 higher plant species, boreal species characteristic for taiga predominating: Linnaea borealis, May lily, cranberry, marsh tea. There are some plants rare for northwestern European Russia: superb pink, Tarta catchfly. The mammal fauna (40 species) comprises typical forest dwellers: the moose, brown bear, marten, squirrel, blue hare are common, and the lynx, badger occur. While the Zapovednik existed, the numbers of the European beaver have increased significantly. The acclimatized raccoon dog, muskrat, American mink are widespread. The avian fauna is particularly numerous and diverse during the migration period, due to the Zapovednik location on the White Sea — Baltic Sea flyway of waterfowl. The aggregations of migratory waterfowl in spring are estimated at 500 thousand — 1 million birds. The common permanent avian dwellers are the capercaillie, black grouse, hazel grouse. The fish species are: the whitefish, lake salmon, zander, lake trout, lake char, wimba. The rare animal dweller of the Zapovednik listed in the Red Data Book of the Russian Federation are: Ladoga ringed seal, black stork, Bewick's swan, peregrine falcon, golden eagle, white-tailed eagle, osprey. 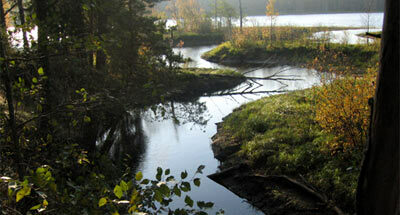 The Zapovednik is part of "Svir Mouth" wetland of international significance.